Modern Rogue is a direct successor to Hacking the System, which lasted for two specials and one full season on cable television. 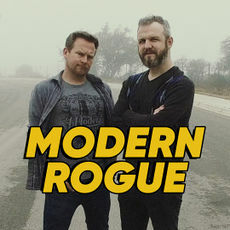 Hosted by Brian Brushwood and Jason Murphy, Modern Rogue is centered around the idea that two middle-age dudes can explore any topic generally considered cool as hell, often to humorous ends with mixed success in the subject at hand. Although Modern Rogue never existed as a product of a network, it took some time for it to properly exist on its own. The first episode was released as a pilot under the Scam Stuff channel, which at the time was also in a nascent state, to gauge interest and viability for the show existing outside of the already established Scam School brand. Netting 45,000 views in the first week of launch, the test showed optimistic potential but wasn't up to the level that a particularly well-performing Scam School might see. From this point onward, Modern Rogue was shifted over to publishing through the Scam School channel, while outtakes were kept on the Scam Stuff channel. The second episode launched on the Scam School channel with a 280% increase over the first at an opening week of 111,500 views. The series continued publishing through the Scam School channel, a couple of which broke past the one million view mark, but starting with episode 31 (Sep 2016) all subsequent episodes would be released on the official modern rogue channel. The departure from the scam school brand was discussed for months internally before the move with many points for and against, there was even a brief period of time when consideration was put into possibly pushing the show back to the Scam Stuff channel, but starting from the ground up and allowing the property to develop its own audience proved the healthiest long-term option. In July of 2017, the Modern Rogue Patreon was launched in an effort to turn the show profitable. This resulted in a variety of behind the scenes material behind the Patreon paywall, exclusive shirts, and an event for touring the Modern Rogue facilities as well as meeting regular guests. The resources resultant from the Patreon freed up some time and injected a little freedom in how to approach episodes that require materials, though not quite substantial enough to make the mission statement of "making it everybody's full-time job" a reality. On January 22nd, 2018, it was announced that former Cracked editor John Cheese would join the team as Editor-In-Chief of the Modern Rogue website. The website was re-designed to accommodate daily articles. This page was last modified on 15 March 2018, at 01:55.